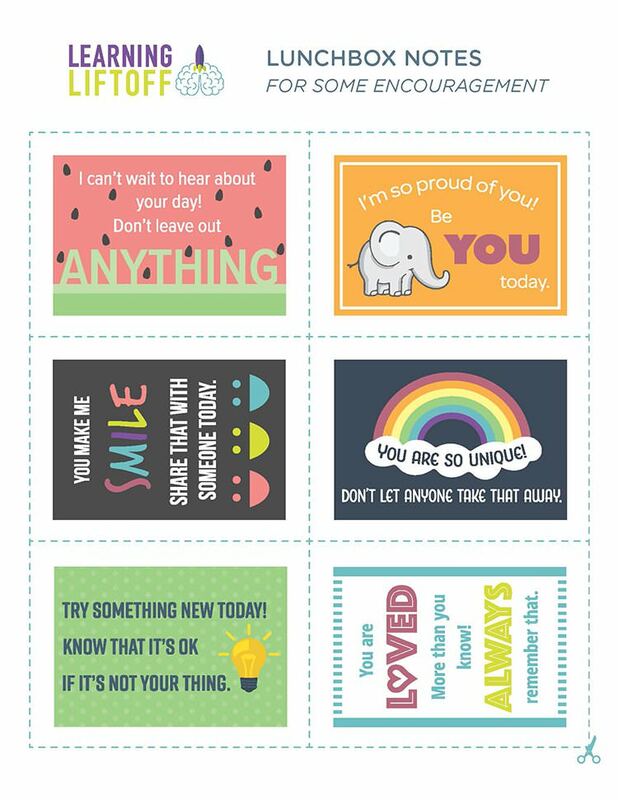 Home / Free Printables / 175+ FREE Printable Lunch Box Notes They’ll Love! 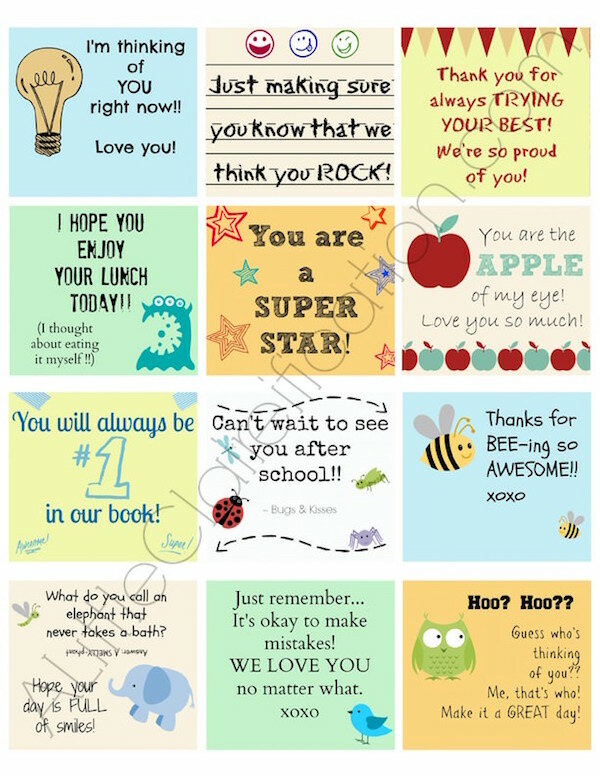 175+ FREE Printable Lunch Box Notes They’ll Love! 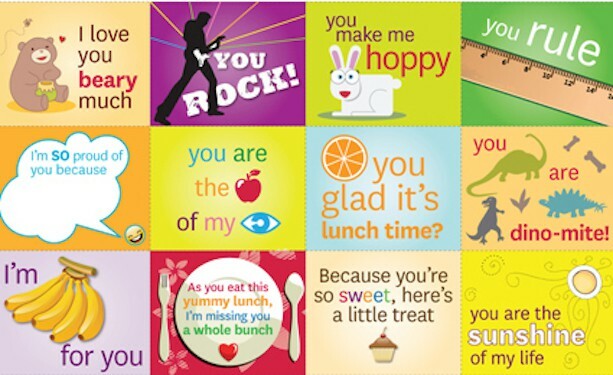 Lunch box notes are such a sweet way to show kids you are thinking about them! 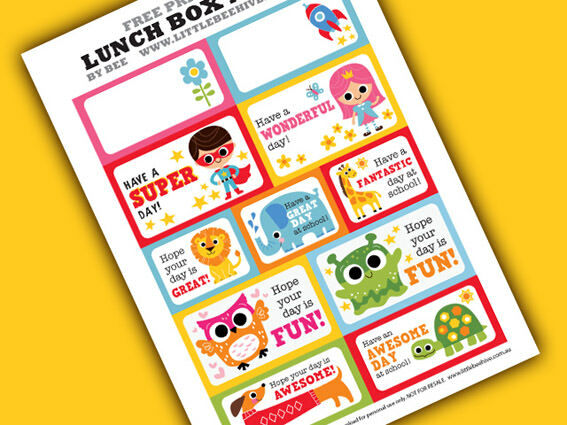 Enjoy these FREE lunch notes for kids – over 175 of them! Is your child ready to go back to school? Or maybe it’s his or her first time? That can always be crazy. When I first went to Kindergarten, I thought I only had to go for one day. The joke was on me when my mom took me back! Lunch box notes are actually a fun way to reduce school jitters, or to even just let your little know that you are thinking about them. Consider sticking or tying the note to one of the food items to make sure that your child sees them (see those tips below). Make the lunch notes more durable by printing them out on thicker paper (cardstock, for example). Some people even choose to laminate theirs! You also don’t necessarily have to put them in a lunch box. They are great for folders, backpacks, or even in the bathroom in the morning while your child is getting ready for school. It’s whenever the mood strikes! 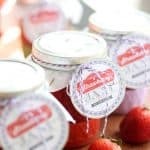 If you need some good ideas for lunch box notes, take a peek at the collection I’ve pulled together. Some are funny, some are sweet . . . I’ve even included some blanks. 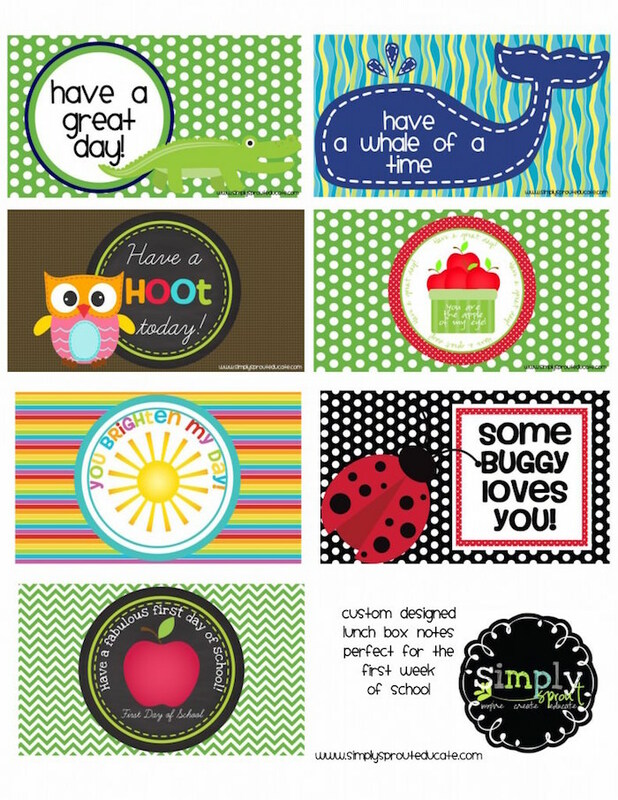 On all of these free printables there are over 175! You are pretty much set for the whole school year. Just scroll down and pick your faves. 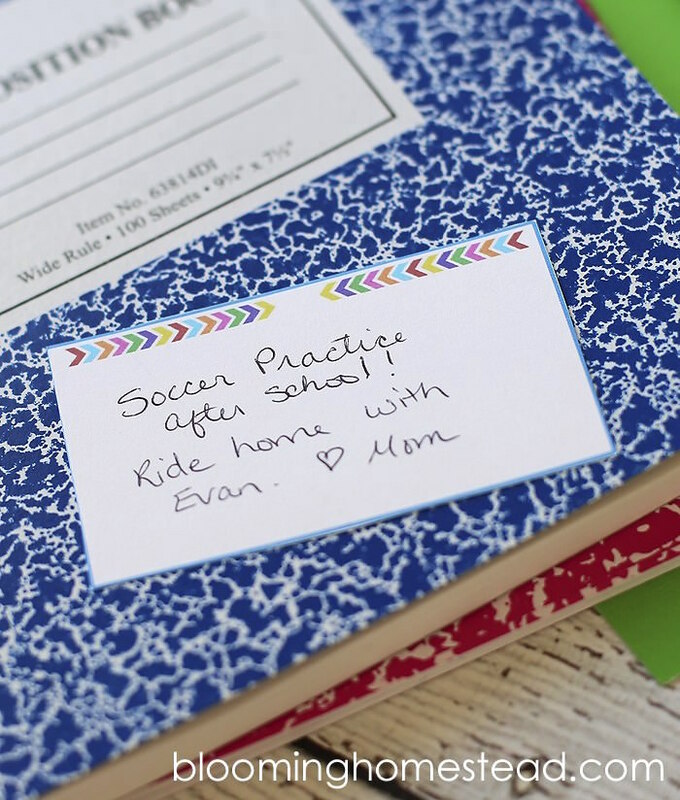 These little notes are good for the first week – there’s even one lunch box note for the first day of school! So sweet. This freebie contains eight notes. These notes are so colorful – I love the scheme! Perfect for printing on sticker paper and adding to a sammich or juice box. This freebie contains ten notes. 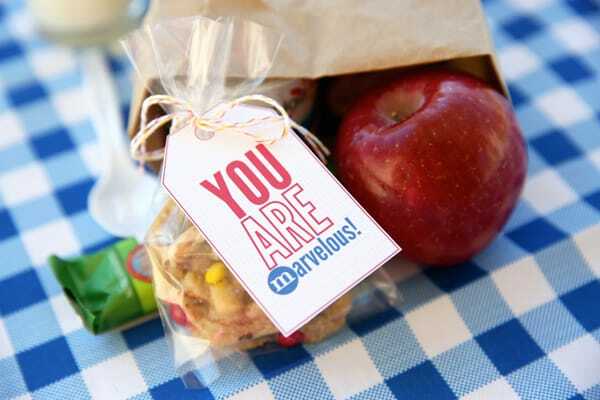 Tie it onto a little treat and imagine the smiles they’ll deliver when they see it tucked away in their lunch box! This freebie contains ten notes. There are lunch box notes, and then there are lunch box jokes. 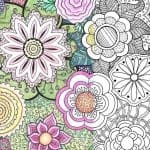 Hopefully these inspire you – and you can even create a few of your very own! This contains four jokes. If you’re a regular reader of this blog, you know how much I love Star Wars. 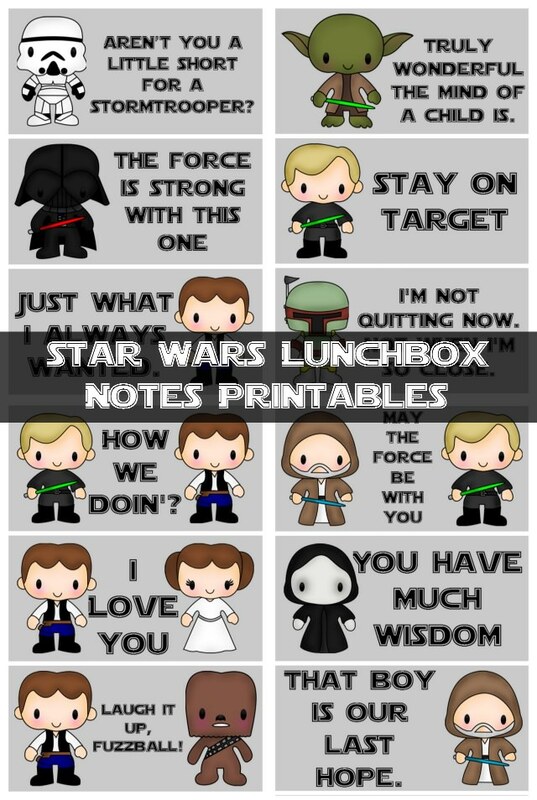 These lunch notes for kids will make sure the force is with them all day. Contains two pages with eight notes each, for a total of 16 notes. 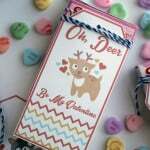 Need some blank lunch notes so you can write your own sweet message? These are perfect. You don’t even have to put in a lunch box – you can hide in a notebook or folder. Contains eight notes. 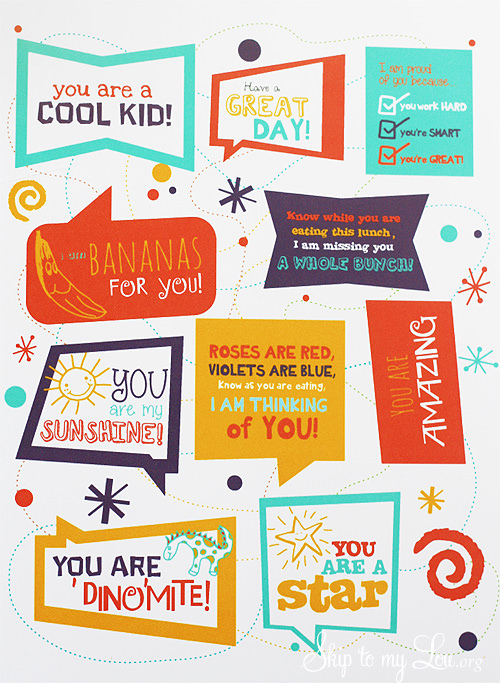 Melissa used some vintage graphics to create these fun lunch notes for kids. There’s even one that says “Happy Birthday!” This set contains ten notes. 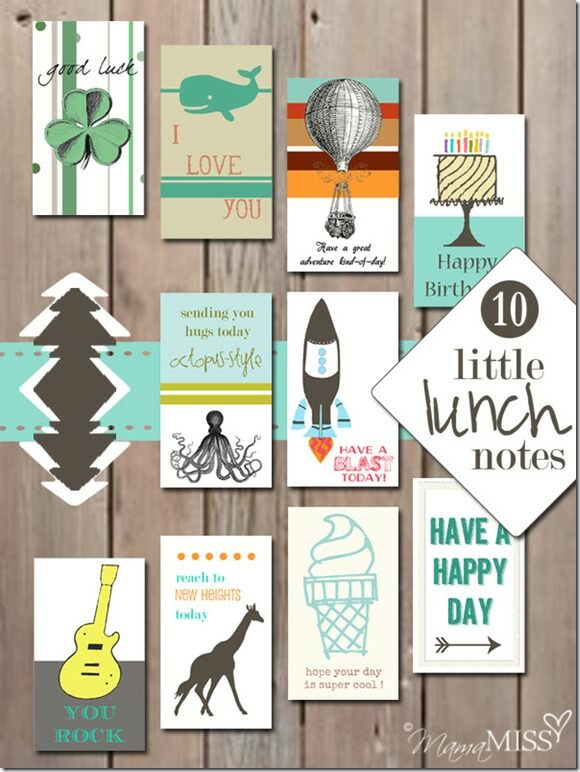 I love the color scheme used in this set of lunch notes! There are a few for boys, a few for girls, and then some for anyone. Cute enough even to use for adults. This freebie contains 11 notes. 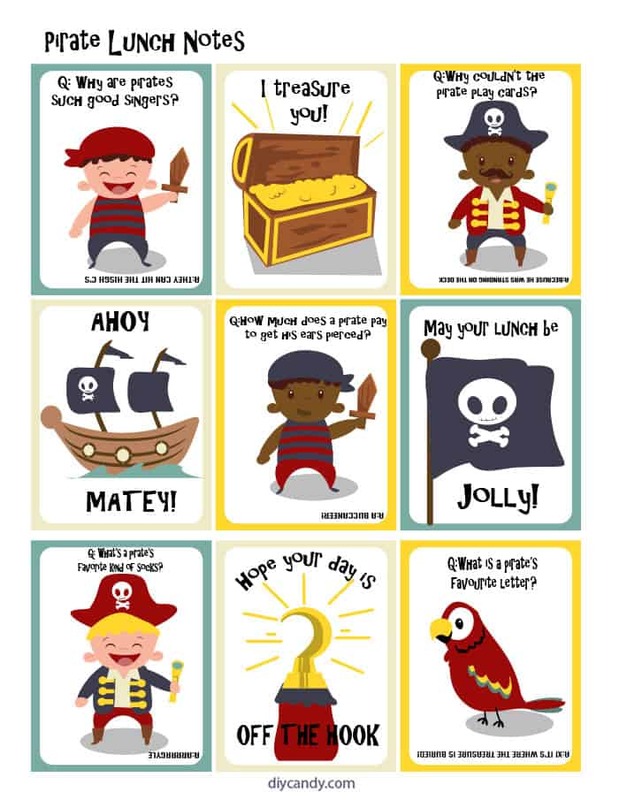 International Talk Like a Pirate Day is September 18th, but you can use these lunch notes for kids any time of year! 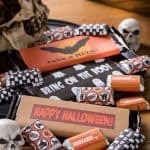 There are some jokes and some fun sayings included. This freebie includes nine notes. 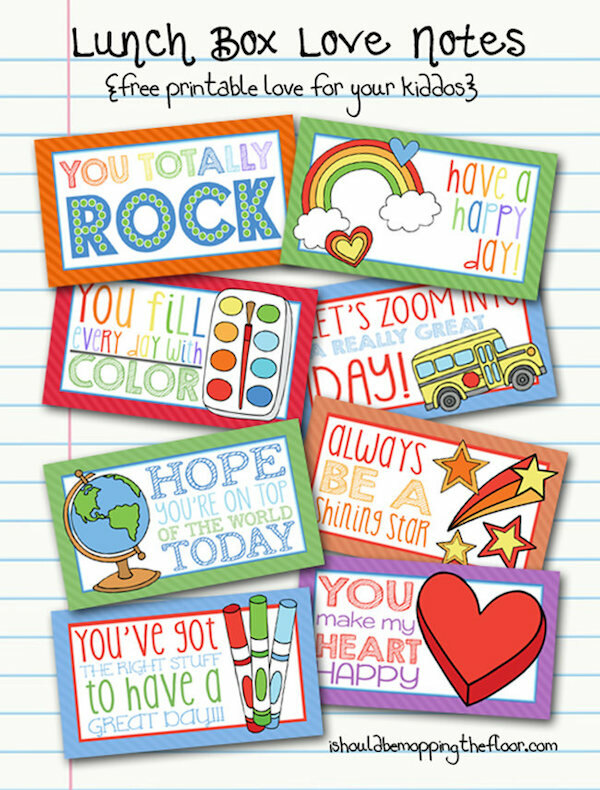 This cute set includes a few with simple messages and a few that you can write in your own message! This freebie includes 9 notes. These lunch notes for kids are so encouraging! So sweet, and they let your littles know that no matter what, you are thinking of them. This free set includes 12 notes. Erin’s mom used notes like these from elementary school all the way up until she was in college! They are choose your own adventure, which makes them extra fun. This set includes eight notes. 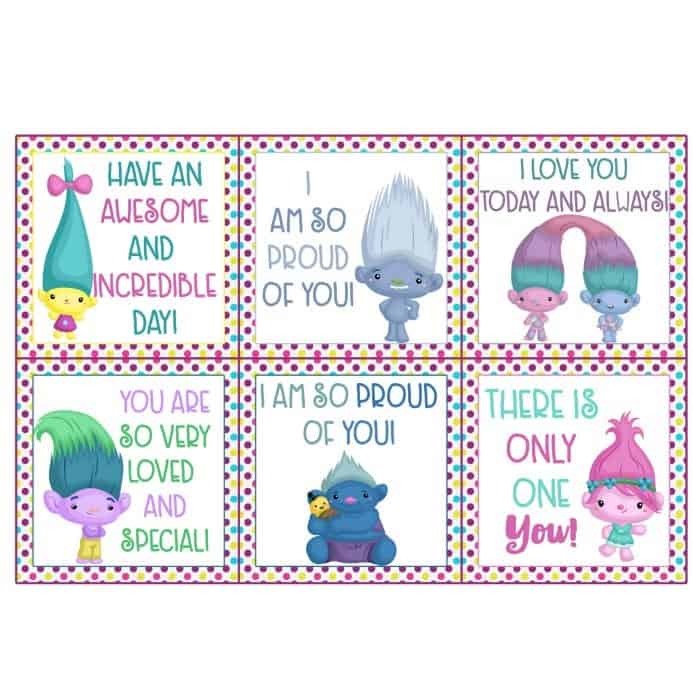 If your kid has seen the Dreamworks movie, they’re going to love these Trolls printable notes! Heck, I wouldn’t mind finding them in my lunch. This freebie includes 6 notes. 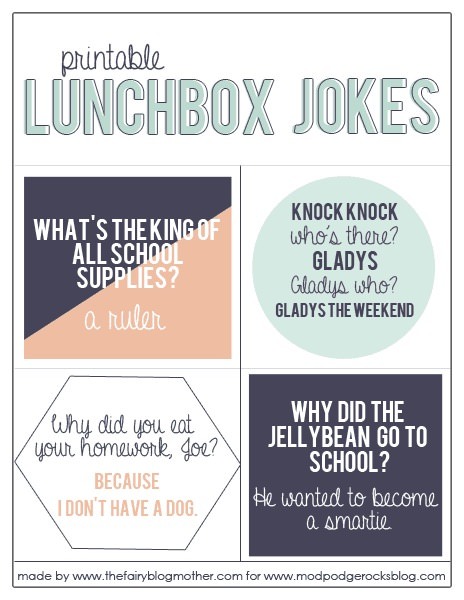 Stick these printable lunch box jokes in a folder or backpack – they are large enough that your child will definitely find them amongst their papers, and the jokes are hilarious! Contains 22 notes (two are blank so you can write your own funnies). 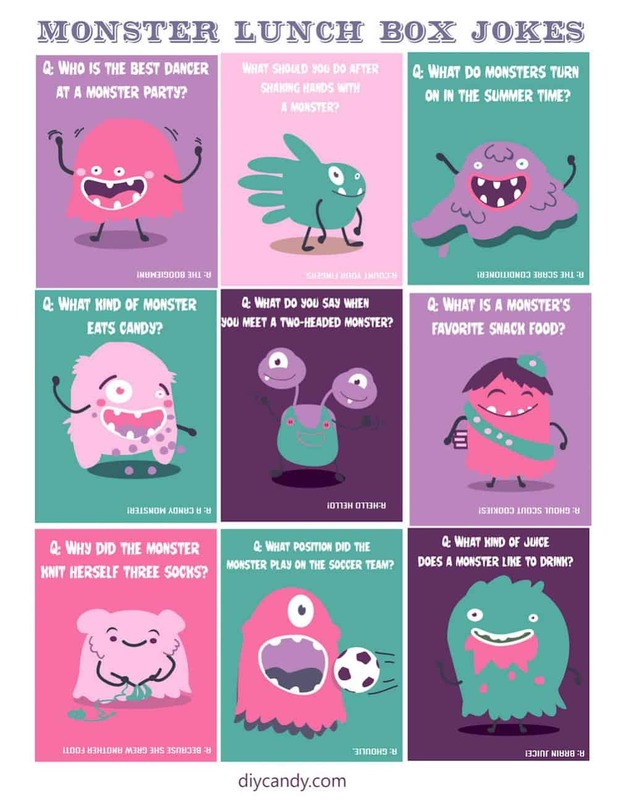 You had no idea that monsters could be silly, did you? Well apparently they tell jokes . . . and you get a sheet of nine (for FREE!) to put in your child’s lunch box. 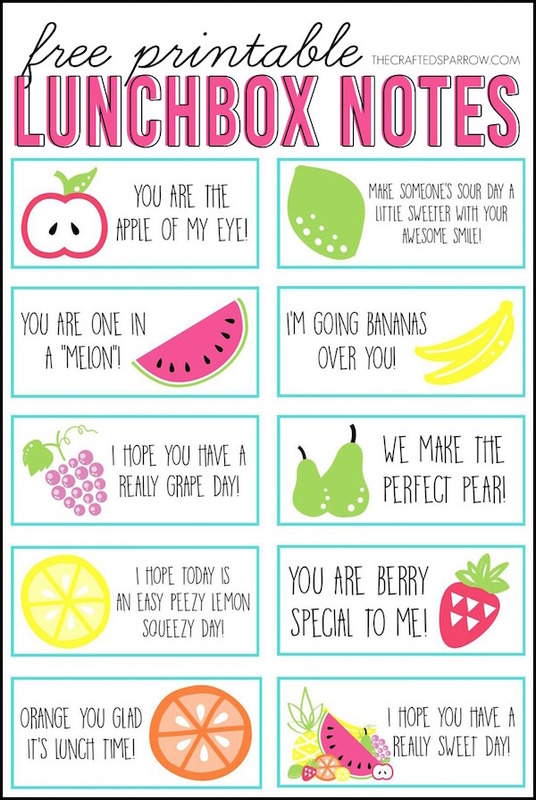 There’s a great combination here of fruit themed lunch box notes – some for kids and others that work for your sweetie as well. So cute! This set contains ten notes. These are rainbow-riffic and will add a splash of color and love to your kiddo’s lunch box! I love all the colors in this set of eight notes. Do you have a special memory that you want to share with your child? 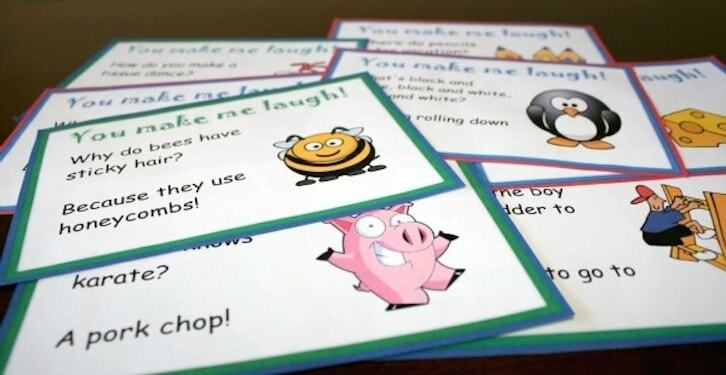 This set of four free lunch notes for kids is perfect for doing that. There’s plenty of space to write something personalized. The school day can be long and lonely! Letise provides three sets of notes – jokes, encouragement, and blank – for any mood or occasion. I love the graphics! You can get 18 free notes here. I think my favorite note in here is the one with the cupcake – because it seems like something delicious would be attached! Haha! There are 12 notes in this colorful set. 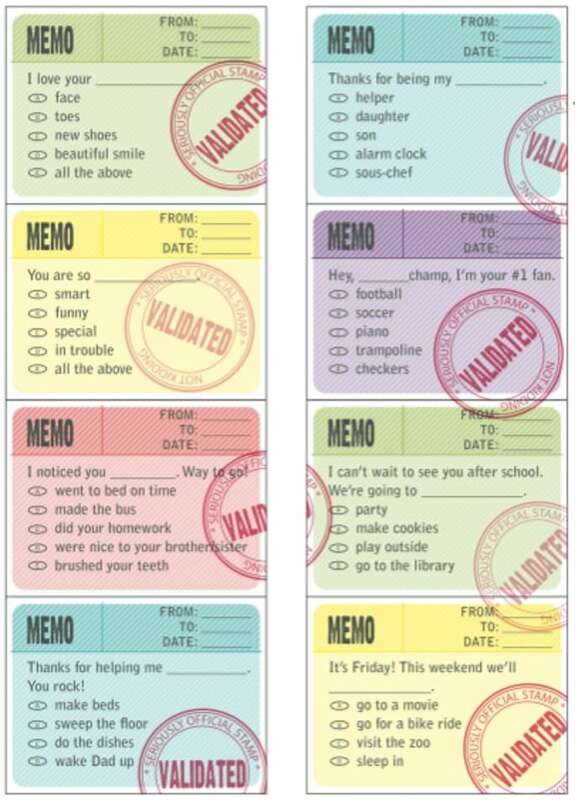 Which set of lunch box notes is your favorite? Do you have a set you’d like to share? If so, let me know in the comments. I’d love to see them!